In my last post, I took apart a single paragraph in Lord Christopher Monckton’s recent testimony to a committee of the U.S. Congress. This paragraph had to do with natural variations in solar radiation, and I showed that 1) Monckton had problems citing the appropriate literature to back his factual claims, and 2) the data he alluded to actually support a conclusion directly opposed to the one he wanted his readers to draw. That is, variation in incoming solar radiation simply cannot explain the last 40-60 years of global warming. This time I decided to hit the entire rest of the section where that first paragraph appeared. The intent of this section of Monckton’s testimony was to convince his audience that “neither global mean surface temperature nor its rates of change in recent decades have been exceptional, unusual, inexplicable, or unprecedented.” Here is the entire text. Global mean surface temperature: Throughout most of the past 550 million years, global temperatures were ~7 K (13 F°) warmer than the present. In each of the past four interglacial warm periods over the past 650,000 years, temperatures were warmer than the present by several degrees (A.A. Gore, An Inconvenient Truth, 2006). In the current or Holocene warm period, which began 11,400 years ago at the abrupt termination of the Younger Dryas cooling event, some 7500 years were warmer than the present (Cuffey & Clow, 1997), and, in particular, the medieval, Roman, Minoan, and Holocene Climate Optima were warmer than the present (Cuffey & Clow, 1997). The “global warming” that ceased late in 2001 (since when there has been a global cooling trend for eight full years) had begun in 1695, towards the end of the Maunder Minimum, a period of 70 years from 1645-1715 when the Sun was less active than at any time in the past 11,400 years (Hathaway, 2004). Solar activity increased with a rapidity unprecedented in the Holocene, reaching a Grand Solar Maximum during a period of 70 years from 1925-1995 when the Sun was very nearly as active as it had been at any time in the past 11,400 years (Hathaway, 2004; Usoskin, 2003; Solanki, 2005). The first instrumental record of global temperatures was kept in Central England from 1659. From 1695-1735, a period of 40 years preceding the onset of the Industrial Revolution in 1750, temperatures in central England, which are a respectable proxy for global temperatures, rose by 2.2 K (4 F°). Yet global temperatures have risen by only 0.65 K (1.2 F°) since 1950, and 0.7 K (1.3 F°) in the whole of the 20th century. Throughout the 21st century, global temperatures have followed a declining trend. Accordingly, neither global mean surface temperature nor its rates of change in recent decades have been exceptional, unusual, inexplicable, or unprecedented. Let’s dissect Monckton’s argument and see what there is to it. As usual, I’ll make sure to give His Lordship credit whenever I find that he has gotten something right, or even in the ballpark. 1. Lord Monckton claims, “Throughout most of the past 550 million years, global temperatures were ~7 K (13 F°) warmer than the present.” He gives no source for this claim, so it’s difficult to tell whether he is accurately representing anyone’s work. But from what I could find out, the 7 K figure is probably an exaggeration. Still, in a qualitative sense Monckton’s point is correct–the Earth was considerably warmer during much of the distant past. The evidence from paleoclimate studies shows, however, that CO2 is an important driver of climate change, and the issue with human-induced climate change is how rapidly we are likely to be driving climatic conditions toward states the Earth likely hasn’t seen in millions and millions of years. Royer et al. 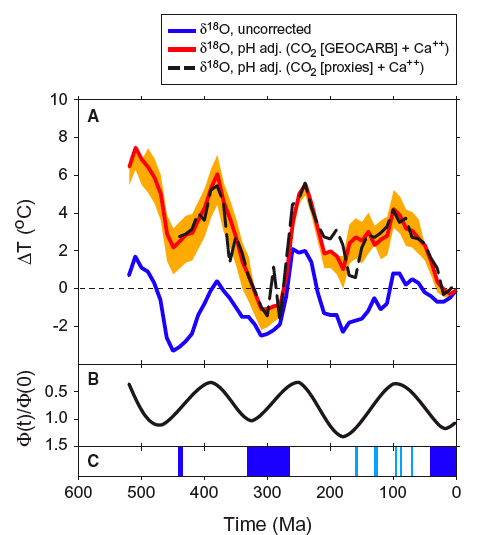 (2004) CO2 as a primary driver of Phanerozoic climate, GSA Today, v. 14, no. 3, pp. 4-10. Royer et al. (2004) reconstructed shallow ocean temperatures over the Phanerozoic, and the graph in Figure 1 shows their results. (The black and orange lines are the ones to look at.) In this graph, each data point is averaged over 10 million years. Since I don’t know what the present global average temperature is relative to the past 10 million years, I don’t really know whether the temperature change values in the graph should be adjusted up or down a little. However, even if we adjusted the curves up a couple degrees, it would still be a stretch to claim that it was 7 degrees warmer than the present over most of the last 550 million years. Qualitatively, however, it has to be admitted that the Earth has been a few degrees warmer during much of the distant past. Figure 1. Reconstruction of shallow marine temperatures over the Phanerozoic Eon, taken from Fig. 4 of Royer et al. (2004). The black and orange lines represent their final estimates, corrected for pH effects on the proxy temperature indicator they used. Although I looked up Royer et al. (2004) because I was trying to find temperature estimates for the last several hundred million years, I should point out that the major thrust of the article was to show that CO2 has been a primary climate driver over that period, contrary to Monckton’s implication that variation in solar radiation is doing nearly all the work. In fact, Royer and colleagues published another paper in 2007 (see Royer et al., Climate Sensitivity constrained by CO2 concentrations over the past 420 million years, Nature, v. 446, pp. 530-532,) in which they used long-term reconstructions of temperature and atmospheric CO2 to show that “a climate sensitivity greater than 1.5 °C has probably been a robust feature of the Earth’s climate system over the past 420 million years, regardless of temporal scaling.” In other words, the global mean temperature rises by at least 1.5 °C if you double CO2 concentration–any less is highly unlikely, according to their analysis. Later in his testimony, Monckton argues that climate sensitivity must be much less than this. There are two more problems with Monckton’s argument. First, the climate scientists are not arguing that a few degrees difference in temperature one way or another is inherently “bad.” Rather, as I mentioned in my last post, humans now appear to be affecting climate in such a way that we are experiencing sustained warming, even when the natural forcings (like variations in solar radiation) are pushing it in the opposite direction. When the natural forcings inevitably start pushing toward more warming, the climate will heat up even more rapidly. Our knowledge of climate history shows that sustained climate change can bring us to “tipping points” where the changes become even more rapid. Even if “change” isn’t necessarily bad, exceptionally rapid change can cause all sorts of problems. E.g., humans and other organisms might have to move to survive if climate conditions change, sea level rapidly rises, and so on. This will be expensive and disruptive for humans–I expect wars will be fought over it. It could be much more traumatic for many other organisms, however. What happens when animals have to migrate to new areas, but the plants they depend on can’t move fast enough to keep up with shifting climate zones? The animals’ habitat shrinks, that’s what. Second, do we really want to push the climate into Paleozoic conditions over one or two hundred years, for Pete’s sake? 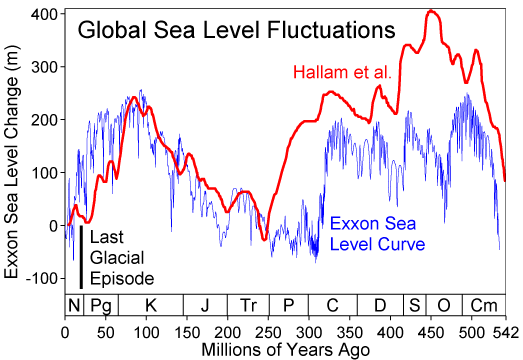 Present-day ecosystems are not adapted to those conditions, but for the sake of illustration, check out the graph of sea level over the last 550 million years in Figure 2, which I swiped from here. Figure 2. Sea level during the Phanerozoic Eon (i.e., the last 550 million years), taken from here. In the past 550 million years, especially during those warm periods Lord Monckton is so fond of, sea level has sometimes been more than 200 m higher than it is now! Now, I’m not saying that the ice sheets in Antarctica and Greenland are necessarily going to collapse, so that sea level suddenly rises 10’s or 100’s of meters in the next one or two hundred years. I am simply pointing out that there is a lot of unpredictable baggage that comes along with bumping the global average temperature up a few degrees, especially if the change occurs relatively quickly. So in this single sentence, Monckton has again given us a statistic that is possibly in the ballpark of accuracy, but he expects his audience to draw a conclusion from it (i.e., it’s ok to cause global warming) that is overly simplistic, to put it mildly. Unfortunately, that’s the best thing I have to say about this section of Monckton’s testimony. The rest is incompetent nonsense. 2. Monckton cites more temperature statistics to show that current temperatures and rates of global temperature change aren’t out of the ordinary in the more recent past. In no case are these statistics “global” in nature, however, and the “local” data he points to does not support his point. Lord Monckton next cites Al Gore’s movie, An Inconvenient Truth, to support his claim that, “In each of the past four interglacial warm periods over the past 650,000 years, temperatures were warmer than the present by several degrees.” Al Gore did show a temperature graph for the past 650,000 years, but that originated with ice core isotopic data from Antarctica, as found in this paper: Siegenthaler et al., Stable carbon cycle–climate relationship during the late Pleistocene, Science, v. 310, pp. 1313–1317. In Figure 3, I have plotted reconstructed temperature over the last 650,000 years from the EPICA Dome C ice core, which is one of the ice cores used for Gore’s graph. Notice that during the last four warm episodes, the temperature got 3-5 °C hotter than it is now. Was Monckton right? Figure 3. 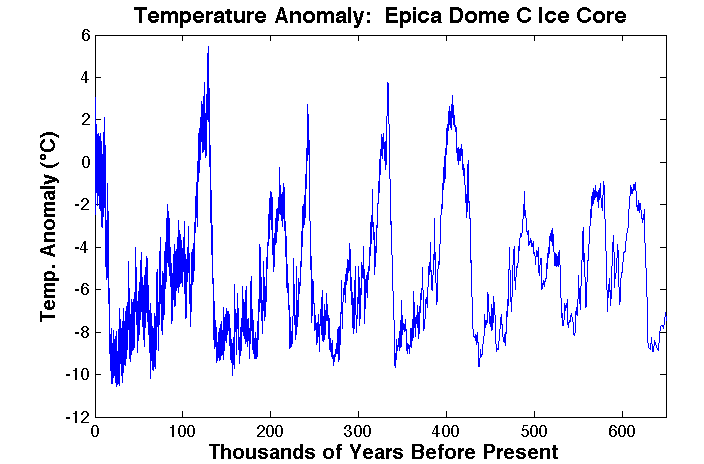 Temperature reconstruction from the EPICA Dome C ice core (Antarctica). The data were taken from here. The problem is that this temperature reconstruction is only good for Antarctica, and the global average temperature difference between the present and the last four interglacials is probably quite a bit less. For example, the IPCC says that “The largest temperature changes of the past million years are the glacial cycles, during which the global mean temperature changed by 4°C to 7°C between ice ages and warm interglacial periods (local changes were much larger, for example near the continental ice sheets).” Meanwhile, Figure 3 shows that Antarctic temperatures swings during the glacial-interglacial cycles were about 8-15 °C, which is double the estimated global average. It seems very unlikely, then, that the difference between present global average temperature and those of the last 4 interglacial peaks was more than a couple °C, or so–hardly the “several degrees” Monckton wants us to buy into. [L]ocal changes must not be confused with global changes. Local climate changes are often much larger than global ones, since local factors (e.g., changes in oceanic or atmospheric circulation) can shift the delivery of heat or moisture from one place to another and local feedbacks operate (e.g., sea ice feedback). Large changes in global mean temperature, in contrast, require some global forcing (such as a change in greenhouse gas concentration or solar activity). This is even more true of a place like Greenland than others, because global temperature changes are amplified in the Arctic relative to other places on the globe, including Antarctica. The huge Southern Ocean acts as a heat sink and dampens temperature changes around Antarctica. Temperature is a more difficult variable to reconstruct than CO2 (a globally well-mixed gas), as it does not have the same value all over the globe, so that a single record (e.g., an ice core) is only of limited value. Local temperature fluctuations, even those over just a few decades, can be several degrees celsius, which is larger than the global warming signal of the past century of about 0.7°C. More meaningful for global changes is an analysis of large-scale (global or hemispheric) averages, where much of the local variation averages out and variability is smaller. Sufficient coverage of instrumental records goes back only about 150 years. Further back in time, compilations of proxy data from tree rings, ice cores, etc., go back more than a thousand years with decreasing spatial coverage for earlier periods (see Section 6.5). While there are differences among those reconstructions and significant uncertainties remain, all published reconstructions find that temperatures were warm during medieval times, cooled to low values in the 17th, 18th and 19th centuries, and warmed rapidly after that. The medieval level of warmth is uncertain, but may have been reached again in the mid-20th century, only to have likely been exceeded since then. These conclusions are supported by climate modelling as well. Before 2,000 years ago, temperature variations have not been systematically compiled into large-scale averages, but they do not provide evidence for warmer-than-present global annual mean temperatures going back through the Holocene (the last 11,600 years; see Section 6.4). There are strong indications that a warmer climate, with greatly reduced global ice cover and higher sea level, prevailed until around 3 million years ago. Hence, current warmth appears unusual in the context of the past millennia, but not unusual on longer time scales for which changes in tectonic activity (which can drive natural, slow variations in greenhouse gas concentration) become relevant (see Box 6.1). Did you get that? We just don’t have data that is complete enough to back up the assertion that there have been warmer global average temperatures in the last 11,600 years. Sure, scientists can make some rough estimates, as we’ve seen above with estimates of global average shallow ocean temperatures over the past 550 million years and of the swings in global average temperatures during the glacial and interglacial periods. But when we’re talking about temperature swings of only about 1 °C, we don’t yet have enough data to make such fine distinctions on a global scale further back than the past 1-2 thousand years. Lord Monckton might counter that we shouldn’t trust the IPCC, because it is controlled by the Commies. (I’m not joking.) But Monckton isn’t a scientist himself, so he hasn’t done his own paleoclimate studies to challenge the IPCC. Instead, he claimed the 1997 paper by Cuffey and Clow supports his assertion about the temperature history of the last 11,400 years. So what about Cuffey and Clow? Do they think their data on the temperature history of central Greenland is sufficient to justify sweeping claims like Monckton’s? It turns out that Kurt Cuffey, a geography professor at UC Berkeley, has gone on record about just this kind of issue. Cuffey was a member of the National Academy of Science panel that evaluated the science behind Michael Mann’s famous “hockey stick” reconstruction of temperatures over the past two thousand years. They found that the science behind the “hockey stick” was basically sound, but noted that uncertainties become larger and larger as we go back in time. Commenting on the NAS report in this news article, Cuffey noted that the problem is lack of geographic coverage as you go further back in time. But lack of relevant data has never stopped Lord Monckton from pontificating about climate change! If he doesn’t have the right data, all he has to do is find some that he can pretend is relevant. Which brings me to his use of the Central England temperature record (CET). Although we can only reconstruct decent global average temperatures back to about 1850, a few localities have much longer records of temperature measurements. Of these, the CET the longest, going back to 1659. Once again, is Central England the entire globe? Of course not, but at least this time Monckton acknowledges the problem of using a local temperature record by claiming that the CET is “a respectable proxy for global temperatures.” What does he mean by that? Normally, if I were to say that data X is “a respectable proxy” for data Y, it would mean that given data X, I could perform some simple mathematical operation on it to obtain a reasonable estimate of data Y. Can we do that? Figure 4. 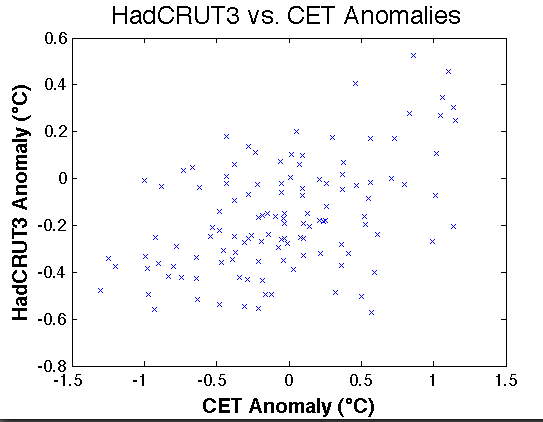 HadCRUT3 annual global mean temperature anomaly and the CET temperature anomaly plotted together. Note that both sets show similar long-term trends, but the CET (being a local record) oscillates over a much wider range. But can we make a simple mathematical model to predict the global temperature anomaly from the CET? 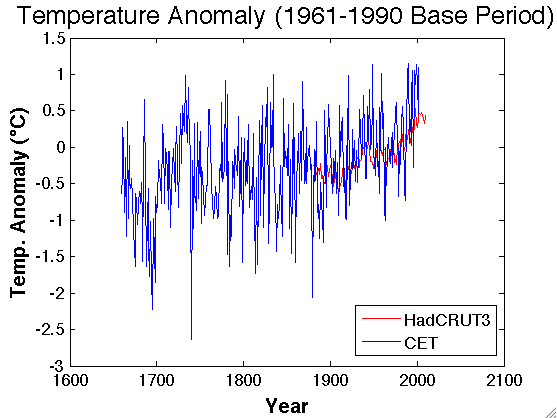 Figure 5 shows the HadCRUT3 anomaly plotted vs. the CET anomaly for 1880-2002. If the CET anomaly were really such a good “proxy” for the global mean temperature, the data on the graph would cluster about a line, rather than looking like a shotgun blast. Just to be a little more quantitative, I also fit a linear regression model to the data and calculated 95% confidence limits, which turn out to be +/- 0.4 °C. That means that, at least over the period where we have both sets of data, we can use the CET anomaly to predict the global mean temperature anomaly, and be 95% confident that the true global mean value is within a 0.8 °C range around the answer the regression equation predicts. Since the global mean only varied over a range of about 1.1 °C during that period, I’d say that the CET is pretty darn useless for predicting the global mean temperature. Figure 5. The annual global mean temperature anomaly from the HadCRUT3 data set is plotted vs. the CET temperature anomaly for 1880-2002. The HadCRUT3 data was obtained here, and the CET data was obtained here. If the CET has varied so much more than the global average, what can we do with Monckton’s comparison between the two? He said, “From 1695-1735… [the CET] rose by 2.2 K (4 F°). Yet global temperatures have risen by only 0.65 K (1.2 F°) since 1950, and 0.7 K (1.3 F°) in the whole of the 20th century.” Well… nothing. Temperatures in central England (or pretty much any specific locality) vary a lot more than the global average… period. So what? 3. Lord Monckton claims that global temperatures have been declining “throughout the 21st century.” But even if he’s right, 10 years is not enough to statistically establish climatic trends. This brings me to Monckton’s final statement that, “Throughout the 21st century, global temperatures have followed a declining trend.” Really? I actually calculate a positive slope in the GISTEMP and HadCRUT3 temperature anomaly series over 2000-2009. And even if the slope were negative over such a short time period (like it was from 2002-2009,) who cares? Even if you don’t know enough statistics to realize that it usually takes at least 15 years of data to get a statistically significant trend in global average temperature data, you can still eyeball Figure 6. Look at the period from 1979-2009, where there is clearly a strong upward trend in the temperature. The fact is that, even during that 30 years, there have been several multi-year periods where the trend was downward. (See Fig. 2 of my last post for a more quantitative treatment of this.) Can you really look at the data and say that we’re on a different overall trend than we have been for the last 30 years? Figure 6. 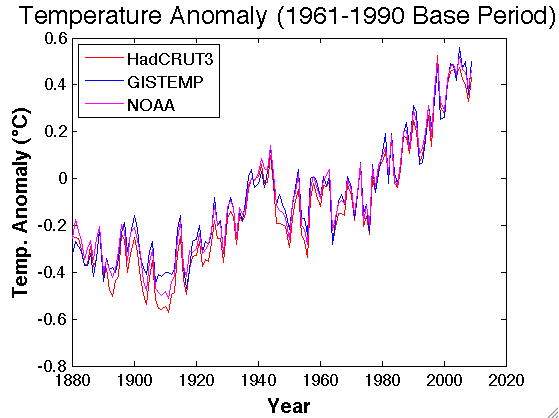 Annual global average temperature anomaly from the GISTEMP and HadCRUT3 data sets. I have examined the section on “global mean surface temperature” in Lord Christopher Monckton’s recent testimony before Congress. Monckton attempted to convince his audience that past global average temperatures have been warmer than the present and global warming trends have been steeper in the recent past. I find, however, that he has used various local temperature records to make sweeping, unjustified claims about global averages. In fact, both the IPCC and one of the authors of a study Monckton cites have warned that this is notoriously bad practice. Hes obviously a fake and a fraud..
Did you read the article at Monbiot.com? If I recall correctly, Bob Carter has a long presentation (on Youtube?) that does exactly the same thing, using the many rapid changes seen in the central Greenland temperature record to “prove” the present global warming is unprecedented. Thanks for this thorough discussion of the issue! The more Monckton has to say about climate change, the more do we get of false claims… I really don’t know if his claims do any good for the anti science crowd, many (almost all) of his claims are just so absurd, people must see through his fraud. But as thefreeorg said, people have the tendency to deny climate change, therefor people will not try to refute his claims as being false. Therefor is it my opinion that this refute as so many others are an important part against false claims that he and others uses to deny science. Still stinging from when you dodged the debate with Monckton earlier this year eh, Barry. Well, look at it this way; you’ve convinced all four of us readers that you have superior science chops to the Viscount’s. You’re the man! Does it bother you that this guy has gone before members of the Utah Legislature and the U.S. Congress and attempted to influence policy by peddling a bunch of crackpot nonsense? Does it bother you that he has falsely represented himself as a member of the U.K. Parliament to members of the U.S. Congress? If you have some argument to show why Monckton hasn’t really misrepresented his sources so he can manipulate policymakers, I’m dying to hear it. And incidentally, I told the SPPI that I would debate Monckton if it were a written, online debate where we could check each other’s sources. Now maybe you can see why they flatly refused. Interestingly, the much earlier “Phanerozoic CO2 levels and global temperatures inferred from changing paleogeography” (1994) looks much more like Royer 2004 than the Scotese 2002/2008 chart, although the time scales seem a bit off from each other, even though Scotese is an author of the 1994 paper.